Protect your iPhone in this soft leather case while carrying it in your pocket, purse, or briefcase. 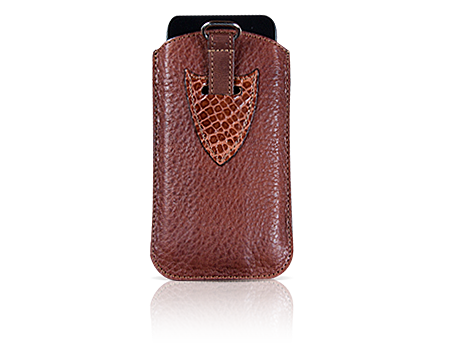 Protect your iPhone® in this soft leather case while carrying it in your pocket, purse, or briefcase. Made in our workshop from Carriage leather and American alligator shield. This phone case features a pull tab for easy phone retrieval. Inside dimensions: 4.875” tall by 2.75” wide.